Dr. James Calvin joined the Johns Hopkins Carey Business School in 1996. He is a Professor of Management and Organizations with expertise in the areas of leadership development, community economic development and nonprofit organizations. 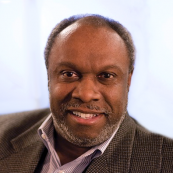 James is member of the Board of The Center for Africana Studies at Johns Hopkins. He has broad global experience in the areas of community development, organization development, leadership development, executive coaching, diversity and inclusion, and negotiation. He worked directly with William S. Woodside former CEO of American Can and founding CEO of Sky Chefs; and James J. Renier former CEO of Honeywell. Dr. Calvin has consulted with business, education, nonprofit, government, and in the international sector with a number of organizations including: The World Bank, DFID, Fannie Mae, Verizon, T. Rowe Price, NASA-Goddard Space Flight Center, J.P. Morgan Chase, The Annie E. Casey Foundation, PepsiCo, Target, The Kellogg Foundation, The Kettering Foundation, The Foundation for the National Capital Region, the states of Arizona, Mississippi, New Jersey and North Dakota, the cities of Chicago and Newark, The Treasury Executive Institute (TEI), The Global Center in Kuwait, and ISPA in Lisbon, Portugal. He is a keynoter to associations, business, government, education and NGO groups across the United States and internationally in Australia, Cameroon, Shanghai, China, Canada, Colombia, Ghana, Hong Kong, Kuwait, Mexico, New Zealand, Peru, Portugal, St. Lucia, Scotland, and the United Kingdom.